To Sum It Up: Darcy Patel is fresh out of high school and on her way to New York with a book deal in hand to embark on her career as an author. As Darcy learns to navigate the publishing world, she also faces the pressure of revising the draft of her soon-to-be-published novel Afterworlds as well as delivering the draft for a sequel. Interweaved with Darcy’s story is that of her Afterworlds protagonist Lizzie Scofield, the lone survivor of a terrorist attack that leaves Lizzie with the ability to see ghosts and cross over into the afterworld. Review: Scott Westerfeld has long been on my list of must-read authors, especially with all of the love I’ve seen for his Leviathan series. 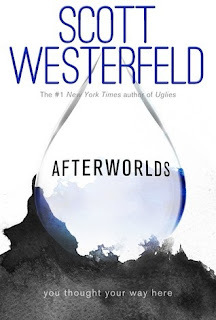 But Afterworlds ended up being my first Westerfeld read/purchase when I spotted a pile of signed copies last December at my local Barnes and Noble (the store permanently closed its doors two weeks ago. *sniffles*). Out of curiosity, I read the jacket blurb and knew I was going home with a copy because the two main characters were named Darcy and Lizzie. I took that as a sign from the Pride and Prejudice gods that this purchase was meant to be. After waiting my usual months and months before getting around to actually reading a book I had to buy, I plucked Afterworlds off the shelf. Or lifted with both hands, more like, because this baby weighs in at almost 600 pages. The book’s heft intimidated me at first; at the rate I’ve been reading lately, I figured I’d need a few weeks to finish. I was most pleasantly surprised, however, by the novel’s crisp pacing in both narratives. It wasn’t long at all before I found myself utterly engrossed in the pages of Afterworlds and utterly annoyed whenever we had to spend time apart due to work, meals, sleep, etc. Another lovely surprise about Afterworlds was its narrative structure; actually, my mind is still kind of blown away by it. In the novel’s “real” world we have Darcy, who wrote a novel in thirty days during her senior year of high school. She’s signed a six figure publishing deal and deferring college for a year so she can move to New York City and work on revising Afterworlds and then get cracking on its sequel. Each chapter of Darcy’s journey into the YA publishing world, told in the third person, alternates with a chapter from her book. Darcy’s Afterworlds is told from the first person perspective of Lizzie Scofield, a teenager whose brush with death forever alters her; Lizzie is now a psychopomp—someone who guides spirits to the other side—and she sees ghosts all around her. Lizzie takes an interest in one ghost in particular, and the ensuing attempt on Lizzie’s part to unravel a mystery and possibly serve up some long overdue justice makes for page-turning reading. I’ve read a few story-within-a-story novels before, but not one with alternating genres. Westerfeld is truly a genius here, effortlessly switching gears every chapter. I would have gladly read either tale as a standalone, so to be able to read both of them in one novel is a unique reading experience indeed. I don’t think I’ve ever been as jealous of a fictional character as I was of Darcy. She’s just out of high school and has already authored a novel, sold it and a yet-to-be-written sequel, and has relocated to Manhattan from Philadelphia to write full time. In other words, Darcy is living my dreams! As much as it appears that she’s on the fast track to success, though, Darcy has her doubts about how Afterworlds will be received and her ability to find the same magic that propelled her to write her debut novel in thirty days. Her path to publication is absorbing to read about, especially considering that you’re literally watching Darcy’s work unfold before your eyes. 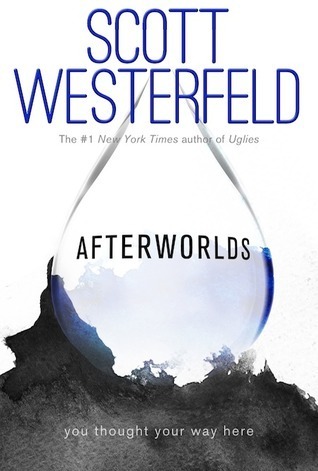 Afterworlds the novel-within-a-novel is just as compelling, so much so that I enjoyed both halves of the book equally. Here again my envy kicks in, as I must credit Darcy with penning an impressive debut. After surviving a terrorist attack at the airport by pretending to be already dead, protagonist Lizzie is permanently able to cross over into the afterworld and see ghosts in the “real” one. She’s startled to discover that the spirit of her mother’s murdered childhood friend Mindy has been with them for years, and Lizzie makes it her personal mission to seek peace for her new friend. The search is riveting, as Lizzie learns that not all psychopomps like her want to help the dead. This Afterworlds is a paranormal that brims with suspense, the type that makes you a little wary of turning the page because there’s a good chance that danger awaits Lizzie on the flip side of it. My only tiny issue with Lizzie’s story was the romance, which felt very insta-lovey, and even by the end of her last chapter, I still couldn’t buy it. But because this is a fictional work written by a another fictional character, I wonder if perhaps the way the romance was portrayed was intended to show an area in which Darcy needed to grow as a writer. Or maybe I’m reading too much into this. Whatever the case, I was too awed by Scott Westerfeld’s prose and how he essentially wrote two damn fine novels in one to dwell on much else. As far as I know, Afterworlds is a standalone, but Darcy’s publishing contract does call for a sequel, which I would read in a New York minute. All in All: I absolutely loved the clever and creative narrative format of Afterworlds. I easily lost myself in both stories, and those nearly 600 pages whizzed by all too soon. Highly recommended if you’re looking to try something a little bit different. I totally understand being hesitant toward really big books, and I was so happy that I fell in love with this one. Being able to read both a contemporary and a paranormal is definitely a bonus, and the contemporary half is very, very good (at least I think so! :D). I already borrowed Westerfeld's Leviathan from the library because I NEED to read more of his amazing writing! I haven't read anything by Scott Westerfeld, but I do own Uglies and have wanted to read a couple of others that have caught my eye. I am glad that you finally read one and ended up liking it so much. It was such an excellent read. I think Uglies is already on my TBR list, but if it isn't I definitely need to add it!